Two years ago a friend gave me a packet of Horned Melon seeds but as it’s a tropical plant, there was no way we could grow it outside here in the Belgian Ardennes. Consequently, the pack of seeds ended almost forgotten about at the bottom of my seed box. Then this year we constructed a polytunnel and around June time I suddenly remembered the seeds! It was already a bit late to start sowing them and I had no idea whether the seeds would germinate …but I took a chance and gave it a go. Out of the three seeds that I sowed, only one came up, by which time all the beds were crammed with different sorts of summer veg. So I planted the little seedling in a pot, attached a string to one of the tunnel’s cross bars and placed it up one corner, where it subsequently got a bit overlooked when it came to watering. 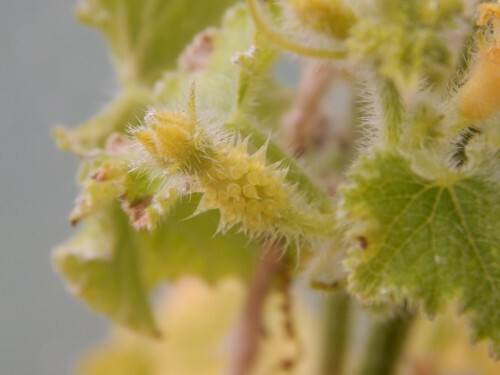 However, it appears the plant thrived on neglect because a few weeks ago I glanced in its direction and saw to my surprise a strange spiky fruit hanging from the vines. 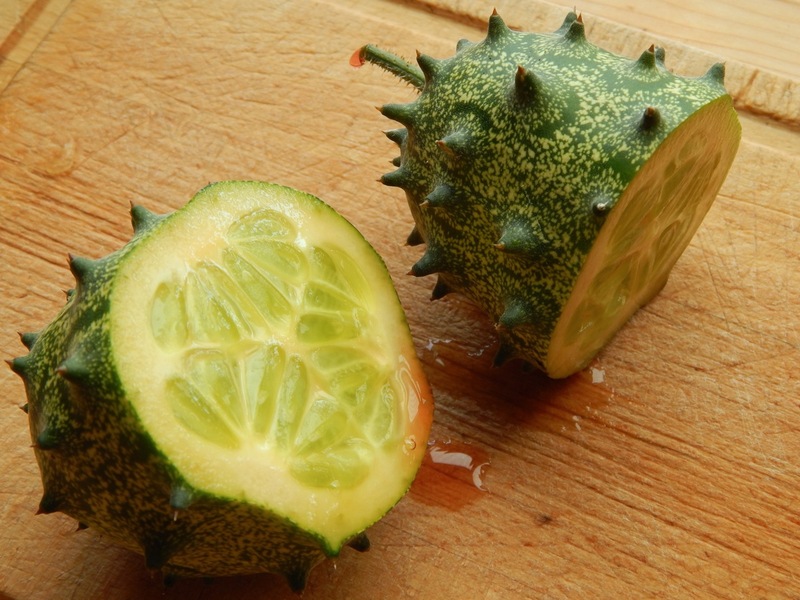 This fruit is known by many different names: Horned Melon, Kiwano, African Horned Melon, jelly melon, blowfish fruit, melano and its Latin name Cucumis metuliferus. As the names suggest, its origins are in Africa, the Kalahari dessert to be precise, but the plant is also grown in the United States, Australia and New Zealand. The fruits look like an oval melon with horns. It’s ripe when the skin is yellow and the inside is lime green. Mostly used for decoration, it’s also perfectly edible with a cucumber courgette kind of taste when picked green and if allowed to ripen on the vine a combination of banana, melon and cucumber. The ripe flesh is a bit gelatinous and I’ve found out that there is a special method for eating this kind of fruit. Containing my curiosity proved too big a task for me and, reasoning with myself that the fruit would never get time to ripen on the vine now that the temperatures had dropped, I harvested it… wearing gloves of course. The flesh was still a bit firm but had a lovely lemony, cucumber taste. As it was not fully ripe, the flesh hadn’t had time to get to the jelly stage which meant it was crunchier and fresher tasting. All in all, the conditions were perfect for my Kiwano plant this summer – lots of sunshine which brought tropical temperatures to the polytunnel. I’ve found out that my infrequent watering was actually just what this plant likes because it needs to dry out between watering. Perfect! The Horned Melon is not really particular about what kind of soil it grows in but apparently tends to prefer a clay or loamy soil. I am definitely going to give growing Kiwano another try next season but I’ll start sowing a bit earlier to give the fruit the time it needs to ripen on the vine. 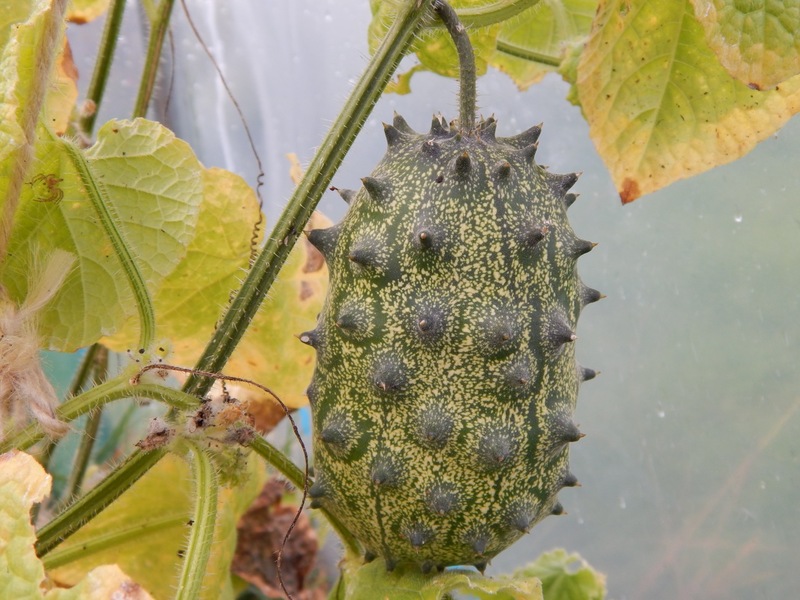 Have you grown anything exotic like the Horned Melon this summer? What an amazing looking fruit! Is the skin edible? Not really and it would be quite a task to get those spikes out of the way. Will definitely give it a go again next year and leave the fruits on the plant to get that banana taste. Apart from the thorny part of the skin, the whole fruit is edible. In its natural ripened state, it has a sweet taste that is like pineapple and cucumber combined. 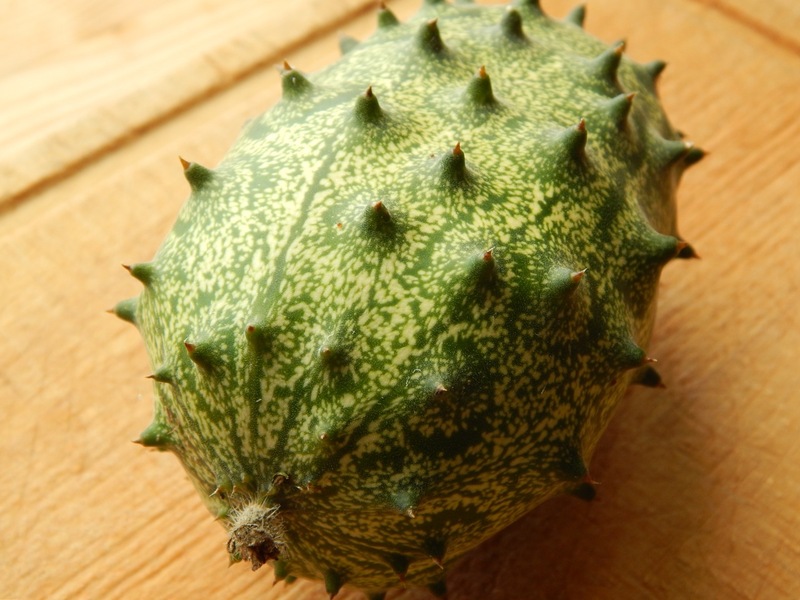 This fruit has the ability to deal with stomach problems, especially if you have hard stool problems. Enjoy the fruit! Thank you very much for your comments and your added information about this wonderful weird fruit! I am growing a kiwano plant here in Sweden, inside ofcourse, but it doesn’t give any fruit. Is there anything I should do? If you are growing it right at this moment it could be the lack of light and maybe even warmth and remember not overwater it, let it dry out a bit. Hope this helps, let me know if anything changes.! 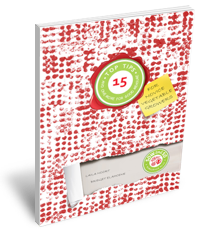 Laila Noort recently posted…Now’s the time to start growing your own! I have recently found this fruit and find it strangely delicious… especially when paired with grilled meats. Drizzled over grilled chicken with a great char is absolutely superb!!! I decided to harvest and dry some seeds to plant in the spring. Do these need to be hand pollinated like pumpkins? Im a sucker for trying to grow grocery and farmers market produce. Some do great, others are not true to their parent due to grafting. Fun hobby either way. Hi Kirby, thanks for your comment. What a great idea to harvest and dry some of the seeds. I would love to know if they will germinate. Pollinating by hand was not necessary since I had lots of pollinators in the polytunnel but you could give it a go anyway. Laila Noort recently posted…Mollusc damage …and it’s time to tickle your peach blossom! What a pleasant surprise! I wonder how it got there as you have not planted it yourself. There must have been some seeds in bird droppings and the seeds germinated. Enjoy your free fruits!!! Laila Noort recently posted…C is for Cauliflorous – Word up! Have grown Kiwano for first time this year. Grew one in a 200mm pot and one in a 350mm pot. The plant in the 200mm pot has 5 fruits which are beginning to ripen (late August). The plant in the larger pot produced a lot more foliage and the fruits are starting to form but I doubt if they will ripen as it will soon cool down. Very easy to grow in a cool greenhouse. Many thanks for your comment. I am glad you were also successful in growing Kiwano plants. Interesting that the plant in the 200 mm pot seem to produce better fruits. Maybe it is because they like a bit of stress to grow fruit. Let me know what you think about the flavour Lee! They magically appeared in our little suburban garden a few months ago after our Apple cucumbers had finished.they look about ready to harvest in June.This will be a first for us so we are excited about the fruit. I grew them this summer in Show Low, Arizona. We are at 6000 feet elevation. I started the plants indoors in early May and transplanted into the ground in late May. The plants did not grow flowers until mid August. It seems like the plant wants to grow quite large before flowering, like a watermelon. Now on September 4th I have at least 10 melons on each plant. Some are starting to turn yellow. I am going to let them fully ripen on the vine after reading feedback here. Hope you will like the taste! This freaky vine cropped out of nowhere in my backyard in South East Queensland Australia. It’s going tropo and has spread 8 foot each direction along the fence, and up the house and along the ground. It’s bearing a stack of fruit and flowers. Its roots are close to the house and thus under the eve, which gives it the sustained dry periods between whatever water it receives from the raised beds either side. Neglect should be this vines middle name. Hope they taste good and ripen sufficiently now the weather is beginning to cool.